Melancholy, of course, visits nearly everyone now and then. “I’m a man, and that is reason enough to be miserable.” wrote the Greek poet Menander in the fourth venture B.C., a sentiment that has been echoed by writers and philosophers ever since. In the 17th century tome Anatomy of Melancholy, English physician Robert Burton advised that everyone “feel the smart of it…. It is most absurd and ridiculous for any mortal man to look for a perpetual tenure of happiness in this life”. It was only when such gloomy states became a “habit”, Burton said, that they became a “disease”. To cure black bile (depression) Hippocrates recommended the administration of mandrake and hellebore, changes in diet and the use of cathartic and emetic herbs. During the Middle Ages, the deeply melancholic person was seen as possessed by demons. Priests and exorcists would be called upon to drive out the devils. Then with arrival of the Renaissance in the 15th century, the teachings of the Greeks were rediscovered, and physician once again offered medical explanations for persisted melancholy. Psychiatry’s modern conception of depression has its roots in Emil Kraepelin’s work, which had two major categories, and later three: depressive episode only, manic episode only and episodes of both kinds. In the short span of 40 years, depression had been utterly transformed. Prior to the arrival of the drugs, it had been a fairly rare disorder, and outcomes generally were good. Patients and their families could be reassured that it was unlikely that the emotional problems would turn chronic. It just took time – 6 to 12 months or so – for the patient to recover. Today, the NIMH informs that public that depressive disorders afflict one in 10 Americans every year, that depression is “appearing earlier in life” than it did in the past, and that the long-term outlook for those it strikes is glum. There was an intellectual challenge to this theory’s legitimacy, an attack launched in 1961 by Thomas Szasz, a psychiatrist at the State University of New York in Syracuse. In the book The Myth of Mental Illness, he argued that psychiatric disorders were not medical in kind, but rather labels applied to people who struggled with “problems in living” or simply behaved in socially deviant ways. Psychiatrists had more in common with ministers and police than they did with physicians. His book helped launch an “antipsychiatry” movement by various academics in the United States and Europe. All questioned the “medical model” of mental disorders and suggested that madness could be a “sane” reaction to the oppressive society. Mental hospitals might better be described as facilities for social control, rather than for healing, a viewpoint popularized in “One Flew Over the Cuckoos’ Nest”, which swept the Oscars in 1975. 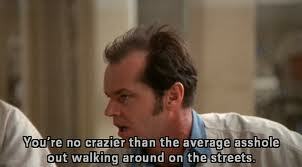 Jack Nicolson’s character got lobotomized (part of his brain surgically removed) for failing to stay in line. And finally internal issues: during the 1970s, there was a deep philosophical split between the Freudians and those who embraced a “medical model” of psychiatric disorders. In addition there was a third faction in the field, composed of “social psychiatrists”. This group thought that psychosis and emotional distress often arose from an individual’s conflict with his or her environment. If that was so, altering that environment or creating a supportive new one (ex. Soteria Project) would be a good way to help a person heal. The field had “identity crisis”. But then they got an idea. The purpose of DART, the NIMH explained in 1988 was to change public attitudes so that there is greater acceptance of depression as a disorder rather than a weakness. It regularly goes undiagnosed and undertreated. And that it could be a fatal disease if left untreated”. Welcome to the epidemic!